Would recommend to anyone who has the will power to tolerate the poor narration in order to benefit from the excellent content. The content is fantastic - Pedro Domingos has written an excellent overview of the field. What didn’t you like about Mel Foster’s performance? The narration is by someone who sounds like they are straight out of an ad from the 1950's. He has that sort of "gee whiz, golly gee" tone, with every sentence seeming to end with an exclamation mark, and pronounces the word "computer" like my grandmother used to while she was still alive: sort of like "commuter" (I'm 50, so my grandmother was born in the 1800's -- you get the picture). 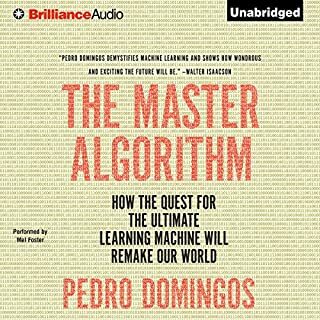 I suggest that audible use a learning algorithm next to choose narrators for each content genre that will resonate properly with the audience -- this one is WAY off base!